Shiatsu is a traditional Japanese manual practice. It is practiced on the ground, through clothing; and consists in stimulating, by pressure, the points of the energetic paths or meridians of the body described in Chinese medicine, and used similarly by the acupuncturist. The therapist may also practice on a chair if the recipient/patient cannot lie down. 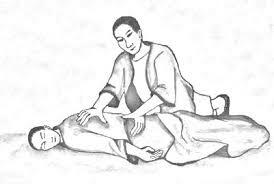 Sei Shiatsu therapy practiced in Santé performs diagnosis and treatment on the basis of Chinese medicine, and is distinguished by taking the ‘Chinese’ pulse which informs of the energy circulation of the recipient. The treatment can thus be oriented to harmonise the energy of the patient over that of the season, restore the balances between the different functions of the body, or restore the energy quality of body organs. The therapist can feel connected to the physical sphere of the recipient, the mechanical structure, as well as to the emotional areas, or even reach the invisible spiritual dimension that vibrates more intensely, but whose manifestations can block the whole body. The practitioner, like a locksmith, will use the right key: sometimes a point, a manipulation, a deep massage, a simple hand placed in fluidic work, a right word, a silence that makes sense. Everything will have to be put in place so that the different layers of the person vibrate in unison.